Green Ammunition | Ammo & Bullet Mfg. Inc. Regular ammunition is made of lead, which may pose hazards to people’s health and the environment. Men and women in uniform as well as shooting enthusiasts and hunters are exposed to lead from bullets. They may inhale lead-containing dust in the firing range or ingest it through game food. In recent years, manufacturers came up with green ammunition, which promises to minimize health risks. Read this to learn about how the U.S. army is using green ammo: https://abcnews.go.com/Technology/story?id=98594&page=1. Green ammunition is a program designed by the United States Department of Defense to eliminate the use of hazardous materials in making small arms ammunition. Green ammunition aims to get rid of heavy metals, volatile organic compounds, and ozone-depleting substances in primers and projectiles. These materials produce harmful wastes and emissions in manufacturing facilities. Due to the health hazards it poses, disposal of unused traditional ammunition is also difficult and costly. There are environmental policies in place to minimize lead air pollution. If you run an outdoor firing range and wish to adhere to these regulations, turn to Ammo and Bullet for green ammunition. Our company contract manufactures top-notch green ammunition for shooting clubs, private companies, law enforcement agencies, and the military. 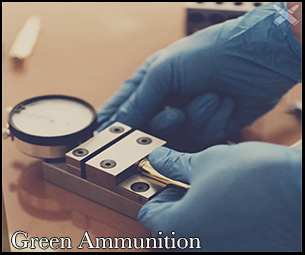 We use state-of-the-art equipment and high-grade materials to create our green ammunition. We thoroughly check our green ammunition products to ensure the safety of our clients. Check out the website of a shooting range or read their pamphlets to learn about their rules. Make sure you read their regulations carefully before you schedule a session. Some clubs may allow you to bring your own pistol. Note that some clubs may have specific rules, such as using only green ammunition. For security purposes, you need to check if your pistol or rifle is empty of green ammunition before you enter a premise. There should be no bullet in your gun’s barrel or cartridge, regardless of whether it is traditional or green ammunition. Remember not to point your gun at anyone especially when it’s loaded. A pistol loaded with green ammunition may cause serious injuries or even death. Note that someone may file a case against you if you point your gun towards an individual, even when it’s not loaded. When you are not shooting, make sure your gun is pointed downwards. This may be common sense but never walk in front of a person with a gun loaded with green ammunition. Mistakes can happen, and a gun’s safety may be faulty. Do not forget to bring mandatory items, such as eye and ear protection and a gun case. You may ask the firing range staff if they offer safety gear for rent. Use earplugs to protect your ears against noise from gunshots. Take note that not all shooters may use silencers for their guns. Additionally, you need to wear goggles to protect your eyes against shells. Rules regarding the disposal of empty green ammunition shells may vary from one shooting club to another. Some may require you to clean up empty green ammunition shells after shooting practice, while others don’t. Looking for High-Quality Green Ammunition? Contact Us Today. If you need a supply of green ammunition, you’ve come to the right place. Ammo and Bullet produces premium-quality green ammunition. Get in touch with us to learn more about our company or to request our contract manufacturing services for green ammunition. We are Ammo and Bullet, an ammunition manufacturer based in Arundel, Maine. Our company develops and produces high-quality ammunition for the military, law enforcement, and businesses. We are proud to offer ammunition assembled using top-notch materials and state-of-the-art equipment in the USA. Since we value the lives of the people who use our products, we pay close attention to detail, particularly during our quality control process. Click here to learn more about our private label here.